In an interview with the “New Yorker” editor, David Remnick, the current leader of this country said “marijuana is no more dangerous than alcohol.” Obama said he still views pot smoking negatively – but that on the whole, the drug isn’t the social ill that it’s been viewed as in the past. “As has been well documented, I smoked pot as a kid, and I view it as a bad habit and a vice, not very different from the cigarettes that I smoked as a young person up through a big chunk of my adult life. 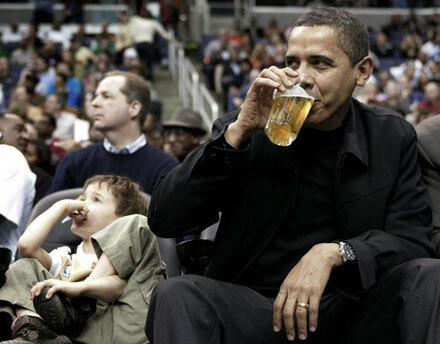 I don’t think it is more dangerous than alcohol,” Obama told the weekly magazine. “It’s not something I encourage, and I’ve told my daughters I think it’s a bad idea, a waste of time, not very healthy,” he said. It’s not something he encourages? Really? What kind of message does this send to our youth? To his daughters? Look at the picture and then consider his statement, “Marijuana is no more dangerous than alcohol.” I do not believe this was a careless, ignorant statement on his part, but rather a well thought-out, planned oration that supports his agenda for this country. I believe the potential for a higher percentage of unemployed, indigent citizens (in need of a government that will take care of them) is actually attractive to Obama. Could it also be that a nation too stoned to pay attention is desirable to a government that wishes to control them? So go ahead, everyone. Toke up and just dull those senses, why don’t ‘cha?